Matt Rothschild, executive director of Wisconsin Democracy Campaign, uses a map of two legislative districts in southern Wisconsin to explain how gerrymandering works. 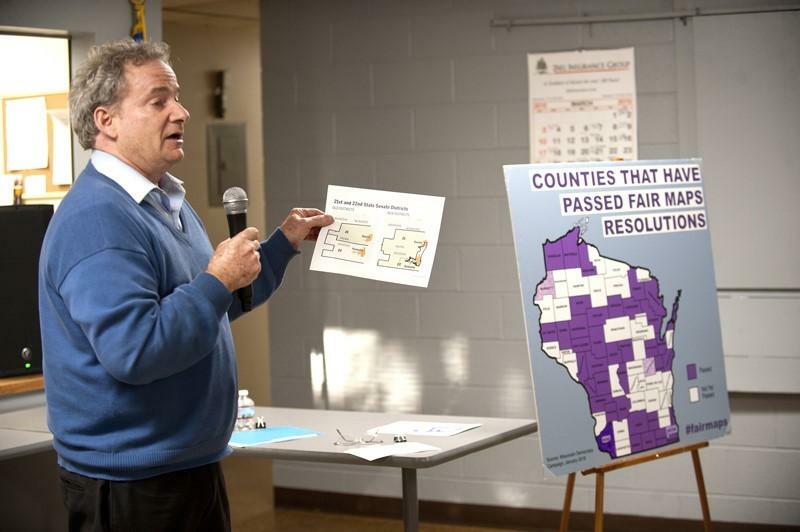 Adjacent to him on a stand is a map of Wisconsin showing which counties that have either passed county referendums or county board resolutions seeking creation of a nonpartisan body to draw future legislative districts in the state. NEWBOLD – Wisconsin citizens need to stand up to both Republican and Democrat parties and demand the creation of a nonpartisan commission to draw the next legislative boundaries, says the head of a government watchdog group in Wisconsin. Sponsored by the League of Women Voters of the Northwoods, Rothschild spoke to 60 or so people at the Newbold town hall. He urged them to pressure county boards to pass resolutions supporting a nonpartisan body tasked with redrawing the legislative map following the 2020 Census. States are required to draw new congressional and legislative districts every 10 years to reflect population changes outlined by the U.S. Census. In a parallel measure, several citizens have challenged the 2011 Republican political map in federal court. They got a favorable ruling in 2016 from the U.S. District Court of Western Wisconsin. That court ruled 2-1 that the map drawn in secrecy by the Republican leadership was “an aggressive partisan gerrymander” that stacked the deck for a Republican majority in the 99-seat state assembly. Using a sophisticated computer data program and experts, the Republicans shifted boundary lines of districts to unfairly constrain the impact of Democratic voters and embellish those of Republicans, Rothschild said. In all, they created nine maps, each succeeding one bolstering their votes. While he didn’t have an example for Oneida County, Rothschild pointed to southern Wisconsin to make his case. The heavily Democratic cities of Racine and Kenosha – who used to be in two districts – were combined into one district (22nd) with the 21st, a more rural district, now electing a Republican. “Now we don’t have competitive races in either district,” he said. Despite holding a 1.3 million to 1.1 million vote advantage over Republicans in the 2018 election, the Democrats won only 36 Assembly seats while Republicans regained control with 63 seats. The Democrats won every statewide office from governor to secretary of state. He said the movement toward a nonpartisan panel has “caught fire in Wisconsin... This is an issue that crosses all ideological realms.” He cited recent polls showing widespread support among citizens, no matter their party affiliation. “This reflects the widespread feeling in the state and in the county that the political system is rigged, and we have to unrig that.” He displayed a map showing which counties in Wisconsin have already passed resolutions at the county board level, or in a few cases countywide referendums, calling for a nonpartisan redistricting body. Locally, Newbold voters will vote April 2 on an advisory question: “Should the Town of Newbold request the Wisconsin legislature create a nonpartisan procedure for the preparation of legislative and congressional redistricting plans?” In addition to the county resolution, Rothschild said it’s important for citizens to directly contact state representatives either by telephone or e-mail to urge them to support the measure. Yet, it may be a stretch to say an “unbiased” map would give Democrats control of the Assembly. That’s because rural Wisconsin leans Republican. Large cities such as Milwaukee and Racine favor Democratic candidates. Gov. Tony Evers’ proposed budget contains a provision to enact a nonpartisan commission, a measure most likely to draw Republican opposition. Under Evers proposal, employees at the nonpartisan Legislative Reference Bureau would draw the political maps in 2021. A nonpartisan five-member commission appointed by legislative leaders of both parties (the four appointed members would appoint their own chair) would oversee their work. Commissioners could not hold a partisan public office or political party office. Nor could they be employed or related to any lawmakers. Enactment of the nonpartisan panel would ensure all citizens “have an equal tug on the rope they call democracy,” concluded Rothschild.